Gods, nymphs, vampires, deathless clones, cursed mages and those who serve them face perils where immortality acts as either curse or blessing or…both. Souls and selves lie at stake in this eclectic bundle. 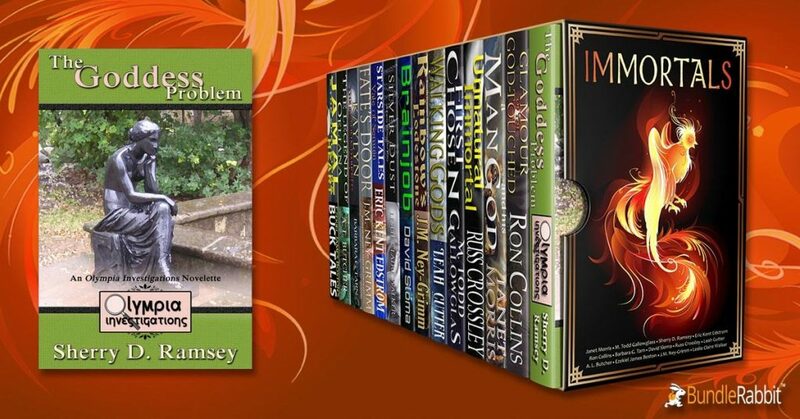 Immortals includes 14 ebooks from short stories to novels, including my novelette, “The Goddess Problem.” This is the second installment in the Olympia Investigations series, featuring Acacia Sheridan, a private detective with a special gift – she can communicate and interact with supernatural creatures of all sorts. In “The Goddess Problem,” a heartbroken Greek goddess comes asking for her help. Acacia’s investigation takes her from an isolated cavern on Earth to the Olympian heights…but can a mortal sleuth wring the truth from a phalanx of dysfunctional deities? The moment she walked into my office, limned in a faint silver sheen, with that grinning, lupine dog at her heel, I knew she was no ordinary client. She didn’t proffer a hand, just sat down in the blue leather chair opposite my desk, and said, “Hello, Ms. Sheridan. My name is Selene. Do you find missing persons?” Her eyes were very serious, very blue, and very fixed on mine. They shimmered a little with unshed tears. She’d made it past the reception desk and Oliver, my often-annoying assistant and cousin, so he must think I should hear her story. Despite our frequent personality clashes, Oliver had developed a keen proficiency at weeding out the cases I’d absolutely hate. I gave Selene my most professional and sympathetic smile, and met those unnerving, if lovely, blue eyes. They were hard as sapphires; old as the sky. I leaned back in my chair, which protested with a squeak. I was suddenly intensely aware of the dust in the corners of the room, the scratched and scabbed surface of my desk, the faint layer of windswept grime on the window behind me, and the lingering scent of tuna sandwich from my lunch. Oliver had been pestering me to repaint the place and freshen it up, but I’d resisted. Maybe he had a point. She smiled a little, and didn’t deny it. I’m the person to see when a non-human client needs help, and I rely on a lot of supernatural word-of-mouth. I was intrigued, and business had been—let’s face it, boring—the past two weeks. Too many mundane insurance investigations and spousal surveillances, and I start to wonder why I wanted to be a private investigator in the first place. A faintly glowing woman with a half-wolf for a pet promised to be, at the very least, not boring. She shrugged elegantly, nodded, and held out a hand. I shook it, her skin pale and cool and luminescent against mine. And that’s how I first met Selene, Greek goddess of the moon. The missing person in question, she told me, was her…hmmm. Not husband, because they’d never married, although according to legend he had fathered some fifty daughters for her. Consort, perhaps? I put him down on my information sheet as “significant other.” Endymion, the man who, either at Selene’s request or his own (reports varied), and by the acquiescence of Zeus himself, slept eternally in order to avoid growing old and dying. I didn’t know that it was much of a trade-off, but there were those fifty daughters to consider. We’d made it only that far when Oliver knocked on the door and bustled in without waiting for me to answer, even though he knows I hate it when he does that. He was the picture of the efficient assistant—ebony hair slicked to one side, not a strand out of place, lint-free black turtleneck with the sleeves pushed up just so, and charcoal grey trousers pressed with a crease sharp enough to cut paper. And a mild, disinterested smile, camouflaging his raging curiosity. Oliver carried a tray bearing two steaming mugs; sweet black coffee for me, and something pale and floral-smelling for Selene. She accepted it with a smile so I assumed he’d asked her in the waiting room what she’d like. He looked a question at me with raised eyebrows—anything else? want me to stay?—and when I shook my head minutely he left us again. To listen at the door, I had no doubt. Oliver could play the detached professional but it was all an act. Anyway, Selene’s story went something like this: after hundreds of years of peaceful slumber in a secret cavern, where Selene joined him every night, Endymion had somehow disappeared. A week ago, Selene arrived at the cave on a Tuesday night and found it inexplicably empty. Although she’d searched for him herself and questioned her fellow divine and semi-divine colleagues, she’d found no sign of him and uncovered no clues to his whereabouts. That’s when she decided to hire me. Bundles are great fun and an excellent deal! I hope you check this one out. Best of luck with this bundle!